When Ed Wagner looks at his daughter, he sees a child who loves to sing, and play tag on the playground. But school officials see a girl whose behavior is often harmful — scratching, spitting, biting, pushing, punching, kicking, slapping, throwing materials, using objects as weapons and making threats to staff and students. Salem-Keizer School District staff put Anastasia Wagner in a seclusion room or restrained her 108 times in one semester. Anastasia, 12, is on the autism spectrum and has severe brain issues. District officials have deemed her behaviors dangerous to her peers, the staff, and herself. Her case is extreme. But on average, students were restrained and secluded 10 times a day in the Salem-Keizer School District during the 2015-16 school year. These incidents primarily affect elementary students and students with disabilities. Last year, 149 students were physical restrained and 145 were placed in seclusion while attending school in Salem-Keizer; 176 incidents resulted in reported injuries to staff and students as a result of the use of the technique. The majority of these incidents involve a small number of the nearly 42,000 students in the district. “Physical restraint” is the restriction of a student’s movement by one or more persons holding the student or applying physical pressure upon the student, according to the state of Oregon. “Seclusion” is the involuntary confinement of a student alone in a room in which the student is physically prevented from leaving. These incidents are happening at a time when restraint and seclusion practices are increasingly under fire. The Oregon State Legislature passed and amended multiple laws within the past four years changing the ways districts use and report restraint and seclusion practices. This year, a bill in the legislature would make any use of restraint or seclusion illegal. But some educators and experts argue the practices are the only techniques that can help protect staff and students when a child is in crisis. Ed Wagner has a stack of restraint and seclusion forms, inches high, from three schools Anastasia has attended in the Salem-Keizer School District. Anastasia first attended Brush College Elementary School in January 2014. “She was antagonized, and not given help when she was unable to communicate she needed help,” Ed said. Anastasia switched to Crossler Middle School in September the same year, but the problems persisted. At home, Ed said he and his wife are able to de-escalate difficult situations without using restraint or seclusion. Typically, they practice breathing exercises with Anastasia and apply light pressure by squeezing her arms and hands until she is calm. He said a weighted blanket helps as well. At her previous school in Arizona, Anastasia was given cards with messages on them she could use to communicate her needs. Families across Oregon and other parts of the country are challenging districts on issues concerning restraint and seclusion. Federal lawsuits have been brought against Lincoln County School District, including one that alleges the staff of Taft Elementary School in Lincoln City confined a non-verbal 10-year-old boy with Down syndrome to a seclusion room about the size of a closet for most of the 2014-2015 school year. The student’s mother, Lynne Mason, said school officials never informed her of her son’s isolation. She said she was told he had a “quiet space” to work in throughout the year — not that he was in a seclusion room. “You never get (the) fifth grade back,” Mason said. Less than two weeks after that lawsuit was filed, Ashley Ballentine, the mother of a 10-year-old special education student at Taft Elementary, alleged her daughter also was confined to a closet-sized room numerous times during the 2015-2016 school year despite her family’s objections. She decided to file a due process complaint with the state board of education, which could lead to a lawsuit. This year, Salem-Keizer’s seclusion practices changed. All seclusion rooms must meet 13 state requirements, including the transparency of the windows, the locking mechanism on the door, ventilation and other requirements. Only one of the district’s rooms met the standards, so teachers have been instructed not to use them. David Fender, the student service coordinator for the district, said the one seclusion room in the district that met all the state standards is at Lake Labish Behavior Center in Salem. With the change, Fender said, there have been fewer than 10 incidents of seclusion this year. Restraint numbers are also lower than last year, with 387 incidents of restraint reported in the district as of April 7, compared to the 625 total incidents reported in 2015-2016. Tim McFarland, a teacher at Englewood Elementary School in Salem, works with special education students in kindergarten through fifth grade. He said much of the behavior that would warrant the use of restraint and seclusion comes from the children’s inability to express or calm themselves. With some students, a break will do, he said. But with the students who continue the negative behavior, more steps have to be taken. 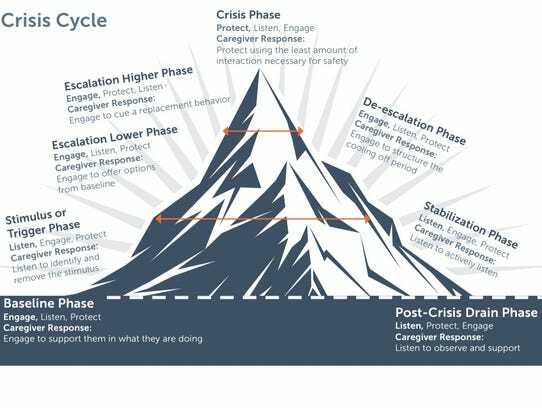 One of the first things McFarland does is assess where the child is in the crisis cycle. The optimal conditions for a child to learn include when they are fed, clothed, have had a good night’s sleep, have a permanent shelter and a stable home life — she or he goes to school ready and able to learn. This is known as “baseline” on the crisis cycle. Laura Mangum-Childers, a former Mandt trainer and behavior specialist, gave an example: If Albert Einstein was being chased by a bear and was asked what two plus two is, even the mathematical genius would struggle to answer. When in fight or flight response, stress hormones and chemicals are released in the body, preparing the person for survival. The person breathes heavily; blood is shunted away from the digestive tract and directed into the muscles and limbs; the pupils dilate; awareness intensifies; sight sharpens; impulses quicken; perception of pain diminishes; the immune system mobilizes with increased activation. People need more than 40 minutes to calm down from going into fight or flight. “But when do we ever have (40+) minutes in education?” asked Mangum-Childers. Instead of letting the child come down from duress, teachers often have to keep moving through lessons. And if the trigger that upset the child is still present, it is likely they will go back into crisis and the cycle will continue. McFarland said he is almost never alone when this happens. Teachers, he said, will have two or three adults present and work as a team to make sure everything is continually monitored. When restraining or secluding a child, McFarland said, he asks himself: Am I doing this in a way that is keeping everyone safe? Where is the student in the crisis cycle? How can I help the student start to de-escalate? He considers these behaviors often are happening at home as well. In the event they restrain the child, local educators are supposed to use Mandt procedures, a training style that aims to give the child the most mobility and freedom of movement to keep all involved as safe as possible. Mandt officials said the practices should not be used to adjust behavior or as punishment. These procedures include side body hug restraints, one- and two-arm restraints and a combination thereof depending on how many people are involved. Most of the positions allow the student to continue to move and have one arm free. Staff guide the student and help eliminate harmful or aggressive behavior that could hurt the student, other students, or staff. Salem-Keizer’s policy states a staff person should only restrain or seclude a student if the child’s behavior poses a “reasonable threat of imminent, serious bodily injury to (him or herself) or others,” and less restrictive interventions are not effective. There are a variety of rules the staff must follow, including how frequently they have to contact parents if an incident occurs, how to contact the parents, and how to develop teams to help the child after five reports are filed. Some parents, like Ed, argue these steps aren’t always followed. Simon Kemp, CEO of the Mandt System, said the program’s goal and philosophy are to avoid the use of restraint, but if staff have no choice, then the priority is to keep everyone involved as safe as possible. McFarland said it is important to get the behaviors under control before high school since the students, at that point, are usually much bigger. He said educators need to “try to figure out what that kid is trying to say.” Are they hungry? Tired? Do they not like the teacher? If the specific school doesn’t have the resources to help, it may need to move the student to another school or space. McFarland said he thinks the school district is doing a good job providing extra adult assistance when he and other special education teachers request it. “Student Services … has been willing to supply extra adult assistance for at least the last four or five years,” he said. “This has made a huge difference in allowing teachers to teach. Still, McFarland is worried about the district not using seclusion rooms currently. Anastasia started the 2016-2017 school year at Lake Labish Behavior Center in Salem with the plan to continue there until she was able to transition back into a traditional school. However, her family removed her from the district after she had a meltdown on a school bus and was handcuffed by police, Ed said. She is being homeschooled for now. For more information, go to www.salkeiz.k12.or.us or call Student Services at 503-399-3101. Natalie Pate is the education reporter for the Statesman Journal. Contact Natalie at npate@StatesmanJournal.com, 503-399-6745, or follow her on Twitter @Nataliempate or on Facebook at www.Facebook.com/nataliepatejournalist. To report improper use of restraint and seclusion, a complaint first has to be filed with the local district. Once the local district’s process has been completed, a complaint is filed with the Oregon Department of Education. Once the department gets the complaint, they use the process that is set out in OAR 581-022-1940. More information can be found online. Read the Oregon Department of Education’s report on the use of restraint and seclusion technical guide online; read Disability Rights Oregon’s report on the techniques online as well. Contact the Salem-Keizer School District at 503-399-3000 or the Oregon Department of Education at 503-947-5600. Chemical restraint, using drugs or medication to control behavior or restrict freedom of movement, and prone restraint, when a student is held face down on the floor, are not used by the Salem-Keizer School District. Mechanical restraint, using a device to restrict the movement of a student or movement or normal function of a portion of the body of a student, is rarely used in the district It has to be pre-approved for a specific reason for specific children.